The hardest part about making a t-shirt quilt; is getting the shirts from you! If this part seems too over-whelming, just call us we are happy to talk you through it! Once you have your shirts picked out, packed, and mailed, I will do the rest for you! 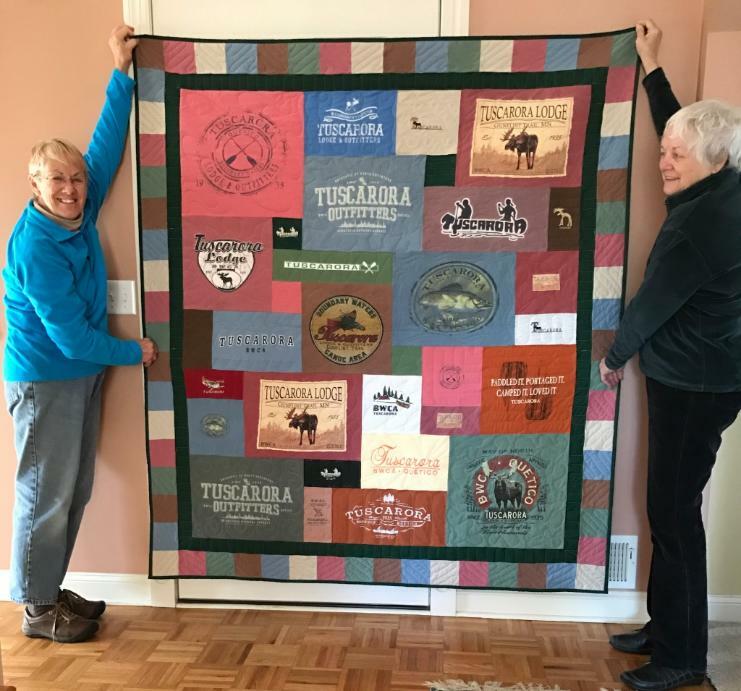 I communicate with my customers and involve them in the process, and will text pictures and keep you well informed on the design and construction of your quilt. Below is an outline of how the process works from start to finish. It all starts with you! Just gather the t-shirts you would like displayed in your quilt. 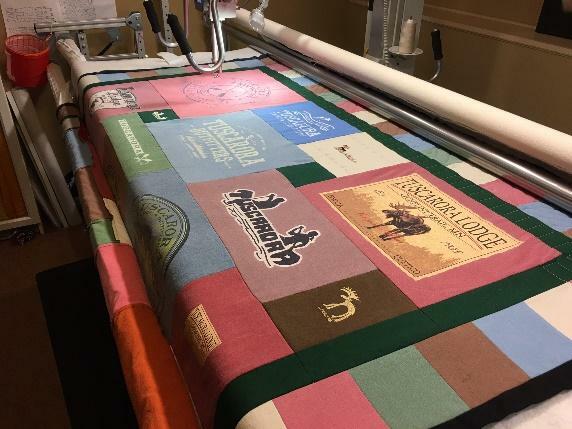 Please refer to our PRICE page for quilt costs, as well as the T-SHIRT PREPARATION page for the steps in labeling and preparing your shirts. 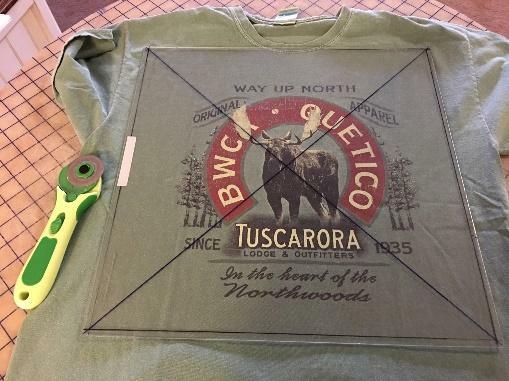 First we cut all your shirts into different size blocks to specifically fit the size logo. Once this is complete, and we have measured and counted your blocks, we will then know the exact size of your quilt. If the quilt size is calculated to be either too large, or smaller than you requested, we will contact you to discuss options. Next we assemble a designed layout of your personal quilt. We will email you a photo of your layout along with the final cost and size. When we have your approval we will sew the blocks together. 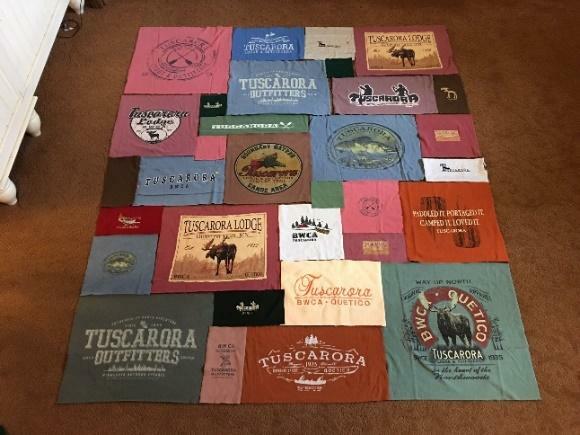 The t-shirt quilt consists of three layers: the top (which is made up of the t-shirt blocks), the middle or batting, and the backing (which will be a solid colored fabric). After the quilt’s top is sewn together, it is then long-arm quilted through all three layers. Each shirt is quilted with a unique design making the back of the quilt look as awesome as the front. 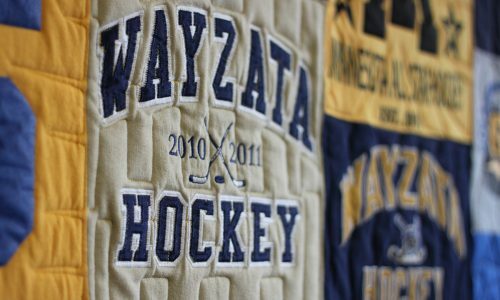 Once your custom quilt is complete, we will email you a photograph of your new t-shirt quilt. Final balance is due at that time, and we will set up a time for you to either pick up your quilt or ship it to you.